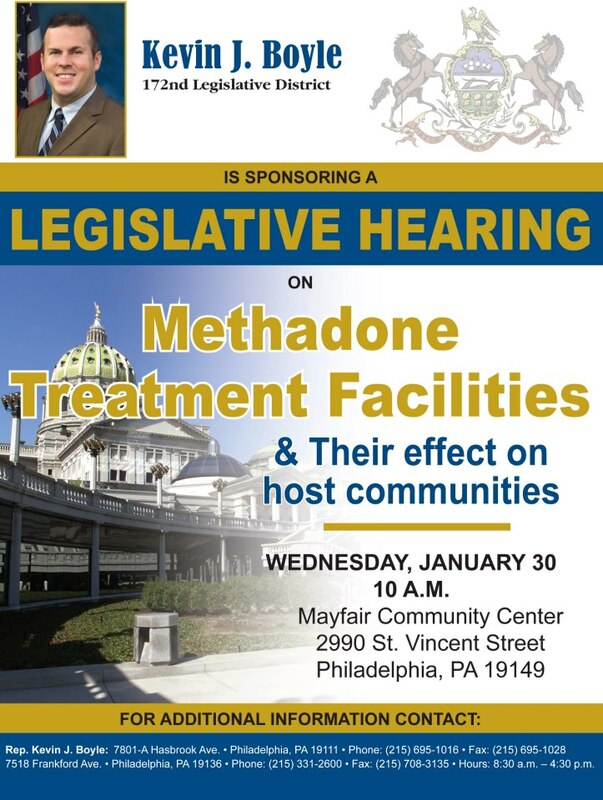 Rep. Kevin Boyle will hold a legislative meeting to discuss Methadone treatment facilities and their effect on communities. The meeting will be Wednesday, January 30 at 10 A.M. at the Mayfair Community Center (2990 St. Vincent St., Philadelphia, PA 19149). For additional information contact Rep. Boyle's offices: 7801-A Hasbrook Ave. • Philadelphia, PA 19111 • Phone: (215) 695-1016 • Fax: (215) 695-1028 7518 Frankford Ave. • Philadelphia, PA 19136 • Phone: (215) 331-2600 • Fax: (215) 708-3135 • Hours: 8:30 a.m. – 4:30 p.m.
Meeting called to order at 7:09 pm by President Joe DeFelice. Milt Martelack Jr. has been appointed the Proviso Enforcement Officer and will be in charge of monitoring and reporting on the provisos set in place by the Mayfair Civic Association Zoning Committee. If a business or zoning applicant is found to be in violation of the provisos set for them during their zoning hearing in front of the MCA, they will be asked to comply and if they do not comply, a complaint will be filed with the Philadelphia Zoning Board to have their zoning revoked. Previous Balance as of 11/19/12: $4229.48. The MCA is now an officially registered 501c4. Tax exempt status was received from the IRS and the MCA will be filing a tax return this year. The money raised for the Methadone Clinic Defense fund via a raffle at the Christmas Craft Show and Tree Lighting ($202) was given to Treasurer Kevin Leonard to give to the Mattioni Law Firm. Lisa Marie Deeley is a staff member of Councilman Bobby Henon. Lisa is not only a Northeast Philadelphia resident but is a regular attendee of many of the Northeast events, is extremely supportive of the local civic associations and extremely responsive to complaints and helping with community issues. At the March 18, 2013 meeting, Lisa Marie Deeley will be honored with a Legislative Honoree Award courtesy of the Mayfair Civic Association. There are no current zoning issues/applications to discuss at this time. Steve Mangan owner of Healthy Concepts Gym will be open by February in the old Giggles and Gifts second store location. In the May 2007 Primary Election, the voters of Philadelphia overwhelmingly approved the creation of a Zoning Code Commission (ZCC) to reform and modernize Philadelphia’s outdated, antiquated, and complex zoning code. This New Code went into effect on August 22nd, 2012. The New Code includes language that Neighborhood Groups(*) must obtain certification as a Registered Community Organization (RCOs). The Tacony/ Mayfair Special District Controls Legislation (commonly referred to as an Overlay) has been removed, and new base districts have been established including CMX-2.5 which was established specifically for Commercial Corridors such as Frankford & Cottman Avenues. The CMX-1, Neighborhood Commercial Mixed-Use district is primarily intended to accommodate low-impact, small-scale, neighborhood-serving retail and service uses in storefront buildings, as well as the types of residential uses allowed in surrounding zoning districts. The CMX-2, Neighborhood Commercial Mixed-Use district is primarily intended to accommodate neighborhood-serving retail and service uses. The range of allowed uses is broader than the CMX-1 district. The CMX-2.5, Neighborhood Commercial Mixed-Use district is primarily intended to accommodate active, pedestrian-friendly retail and service uses in commercial nodes and along commercial corridors. The range of allowed uses is slightly narrower than the CMX-2 district and the development standards are intended to promote a pedestrian-oriented environment. The primary purpose of the CA-1 and CA-2, Auto-Oriented Commercial districts is to accommodate a very broad range of uses, often in the physical form of shopping centers and other destination-oriented uses in which a large percentage of customers will arrive by automobile. (*) Mayfair Civic Association is a Registered Community Organization (RCO), August 15th, 2012. A decision from the oral arguments hearing from the court of common pleas held on 11/05/12 is still pending regarding the ongoing case with The Healing Way. A hearing was held today (01/23/13) for the Northeast Treatment Centers (NET) attempts to open up in Holmesburg on State Road next to Sweet Lucy's. Due the amount and length of testimony by NET, a continuance of the hearing will be held on March 6, 2013. 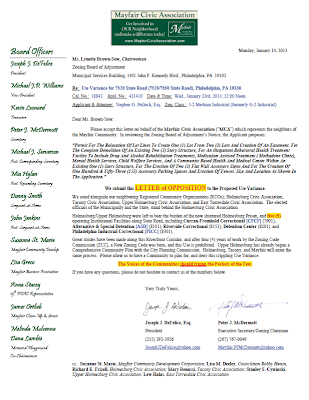 The Holmesburg Civic Association is opposed to this treatment center and the MCA wrote a letter in support of the HCA'a opposition of the methadone clinic for the zoning hearing. Currently, via donations, $3000 has been raised for the neighbors defense fund to help offset ongoing legal costs incurred by the case. Any other donations for the defense fund can be sent to Mattioni Law Firm located at 399 Market St. Suite 200 Philadelphia, PA 19106. More information is available on the MCA website mayfaircivicassociation.com. The Shamrock Shuttle is scheduled for Saturday, March 2, 2013 and the Northeast Erin Express for Saturday, March 9, 2013. The MCA plan on meeting with the new 15th police district Captain McCloskey and the participating bar owners as they did last year to discuss a plan of action and areas of improvement to combat public urination, sanitation issues and quality of life issues throughout the neighborhood. 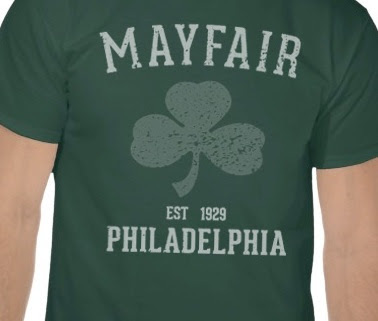 Mayfair Town Watch will also be patrolling the neighborhood and Frankford Avenue that day during the event and an increased police presence will be requested from the 15th Police District. Bill Becker, owner of Headquarters (7213 Frankford Ave) is the newly appointed chairman of the Mayfair Arts Initiative. Starting in February, Headquarters will also be offering art lessons for children and adults in their store. You can email Bill Becker at tattoodad237@gmail.com for class information and pricing. Third Thursday--The Mayfair Arts Initiative will host an informal gathering of Northeast Philadelphia artists at Headquarters or another public location (TBA) every Third Thursday of each month. Local artists, artisans and anyone with an interest in the local art scene are welcome to attend. Visit "Mayfair Arts Initiative" page on Facebook for more information and meeting locations. Avenue Art Project--The MCA would like to see an increase in public art installed on Frankford Avenue. A sculptures to be placed at Frankford and Cottman is in the early discussion phase. In 2013, the Mayfair Farmers Market will be held on a bi-weekly basis on Ryan Ave at Frankford and Cottman Ave. starting on April 21, 2013 and ending on Sunday, October 20, 2013. A flier with all of the tentative dates was made available to meeting attendees. A finalized version of the vendor application will be made available on the Mayfair Civic Association website (http://www.mayfaircivicassociation.com), the Mayfair CDC website (http://www.mayfaircdc.org/cms) and the Mayfair Business Association website (http://mayfairbiz.blogspot.com) as soon as it is completed. The Mayfair Farmers Market is currently sponsored by the Mayfair CDC and Republic Bank. Currently, another sponsor is being solicited for the 2013 season. Please contact Joe DeFelice (josephjdefelice@yahoo.com) or Suzann St. Marie (sstmarie1@aol.com) if you or your business is interested in sponsoring. The CDC has applied for a Business Privilege Tax application to partner with Allegheny Iron. Instead of paying taxes to the city of Philadelphia, Allegheny Iron would partner with the community group and directly contribute $85,000 a year to the Mayfair CDC to be used for improvement and maintenance projects in Mayfair. Approval of the application from the city of Philadelphia is pending. The CDC continues to monitor the house at Sheffield and Frankford that was going to be taken over under a conservatorship program. However, the owners of the house have been doing improvements including new windows, new flooring and extermination of the pests in the house. The plan is for the house to be put on the market to be sold. The 2013 Easter Egg Hunt is scheduled for Saturday March 16, 2013 from 11am to 1:00pm. As always, community volunteers are needed to help with the planning and preparation for this event as well as volunteers for the day of the event. Bakers are also needed for the Bake Sale Table. There is a meeting planned for Tuesday, 02/05/13 at 7:30pm at the Mayfair Community Center. Please contact one of the committee members via the playground Facebook page at "Rebuild Mayfair Memorial Playground (at Lincoln High School)" or at mayfairmemorialplayground@yahoo.com if you are interested in volunteering. All proceeds for this event will continue to go towards new fencing and equipment at the playground. Mayfair Town Watch President Anna Stacey reiterated the need for new members to patrol the streets with current member. Currently patrols are limited due to lack of patrolling members. The next 2 hour certification meeting will be held on February 4, 2013 at the Mayfair Community Center. Clean-ups have been halted during the winter but they will be starting back up in April. The committee is always looking for suggestions for areas in the neighborhood that could use a cleanup. Make any suggestions about areas that need a clean-up via the their Facebook page at "Mayfair Clean-up". A fundraiser was held at the Grey Lodge Pub on 11/10/12 with raffles and a 3-hour afternoon happy hour with cash bar. The committee was looking to raise money to file for 501c3 status and has approximately $500, which should be enough to get the process started. The committee is looking to formalize itself by holding officer elections at an upcoming meeting and establishing a bank account with their current funds. The long-term goal is to raise money for fencing and long-term maintenance which is estimated to be approximately $10,000. This is the sixth year for both the MFMF and the Mayfair Fallen Heroes Run to be held on Saturday, May 18, 2013. This year's Fallen Heroes Run will honor Officer Chuck Cassidy. Sergeant at Arms, Donny Smith spoke about the possibility of expanding it this year by closing off Frankford Ave from Bleigh to Wellington and condensing all participants into that area. It was also suggested that it might be beneficial to hold the Mayfair Farmers Market on the same day. A planning meeting will be scheduled within the next couple of weeks to formalize plans. HIAS Pennsylvania, Refugee Food Security and Nutrition Coordinator--Chloe Tomlinson presented information about her organization which provides legal and social services to refugees located in the Philadelphia area. There are several families from Iraq and Sudan trying to rebuild their lives within Mayfair and they would like to connect with and contribute to the community through community gardening as they are typically coming from an agricultural background. Ms. Tomlinson asked for suggestions to identify areas of greening and can be contacted at ctomlinson@hiaspa.org. Everyblock.com--Laura McColgan presented information about her organization Everyblock.com which is a neighborhood news website owned by NBC. Upon signing up, members can customize their page by zip code, neighborhood, and view posted civic meetings, community events, crime statistics, local restaurants, and real estate listings on a weekly basis. Suspicious activity and city issues can also be reported on the page as well. Turning Points for Children--Lou Grow presented information about his organization Turning Points for Children (TP4C). TP4C's mission is to support families in raising safe, healthy educated and strong children by partnering with caregivers to develop and strengthen protective qualities and by offering them the tools, skills and resources they need to ensure their children's optimal development. Services include: social work, mental health, parenting classes, and food and wellness networks. Many of these services are free and no health insurance is needed. TP4C will be holding a community forum on Wednesday, February 13, 2013 from 6pm to 8pm at the Tacony Baptist Church located at 4751 Disston St. Philadelphia, PA 19136. For more information email info@TP4C.org or visit TurningPointsForChildren.org. 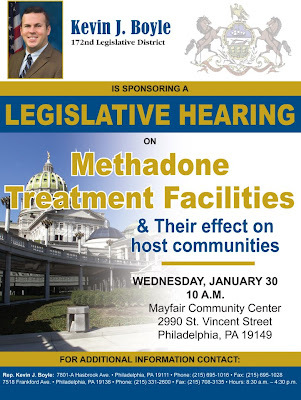 Legislative Meeting--Rep. Kevin Boyle will hold a legislative meeting to discuss Methadone treatment facilities and their effect on communities. The meeting will be Wednesday, January 30 at 10 A.M. at the Mayfair Community Center (2990 St. Vincent St., Philadelphia, PA 19149). For additional information contact Rep. Boyle's office at 7518 Frankford Ave. Philadelphia, PA 19136, Phone: (215) 331-2600 Hours: 8:30 a.m. – 4:30 p.m.
Engine 38 has been reopened in Tacony. However a neighbor, who is a Philadelphia firefighter, alleged they may be subject to brownouts where it will be closed 3 nights out of the week. This has not been confirmed. Lt. Cook (PSA 3) from the 15 police district introduced herself along with 2 of her team, Officer Bill Smith and Officer Mike Smith. Lt. Cook and the Officers Smith are looking for community feedback regarding their concerns and hot spots in the neighborhood as well as quality of life issues. Officer Smith's email was provided to Mayfair Town Watch President Anna Stacey. Attendees were offered the opportunity to speak with the officers after the meeting to discuss specific issues within the neighborhood. The officers were recently involved in the prostitution bust in Tacony and are aware of increasing issues of homelessness in Pennypack Park down by the Solly Ave. Bridge. There were questions regarding the methadone clinic (Healing Way) and the lease agreement with landlord Dennis Kulp and The Healing Way. The Healing Way is approximately 2 years into their 5 year lease with Dennis Kulp. There were concerns regarding increased vagrancy, drug sales, and the services that were explained and offered by some of the public presenters at the current meeting such as food resources for low income families and free mental health services. The person raising the concerns was worried that increasing the availability of these services in the area would lead to larger issues and a further decline in quality of life issues. MCA president Joe DeFelice explained that MCA meetings are an open forum for community information. Lynne Plata is looking for volunteers to help at Mayfair Elementary to establish a Safe Corridor Program. There are reportedly issues with traffic around the school during pick up and drop off, safety crossing the major streets, and understaffing of crossing guards. Ms. Plata is asking for 1 hour a month. It was suggested that Ms. Plata start a Facebook page for the group to increase awareness of the issues and recruit volunteers. Ms. Plata's contact information is 215-450-0386 or lynnecroth@yahoo.com. Jack Costello Boxing Club (located at Longshore Avenue & Tulip Street) is holding a Social Fundraiser on Saturday, February 23rd, 2013 to raise funds so they can continue to offer their programs to neighborhood children & young adults. The fundraiser will be held at District Council 21 Banquet Facility (2980 Southampton Road) from 8:00 p.m. till 12:00 Midnight. The cost is $35 includes Open Bar & Buffet. St. Matthew's School and Parish invites all alumni to join their Facebook page at "Saint Matthew Parish Social Events Committee” (https://www.facebook.com/pages/St-Matthew-Parish-School-Social-Events-Committee/186293594794269?ref=ts&fref=ts) to remain updated on fundraising and social events that directly benefit the school and the parish. The next MCA meeting will be scheduled for March 18, 2013 at 7pm at the Mayfair Community Center. This meeting will be the yearly Candidates Night. Meeting minutes submitted by Communications Secretary Mia Hylan on 01/25/13. 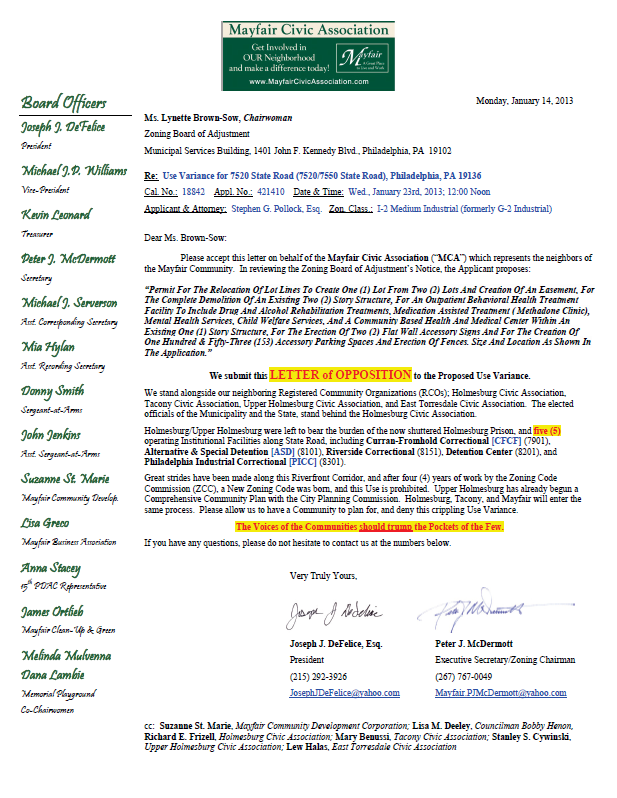 Mayfair Civic Association's Letter of Opposition to Proposed Methadone Clinic at 7520 State Rd. We submit this LETTER of OPPOSITION to the Proposed Use Variance. We stand alongside our neighboring Registered Community Organizations (RCOs); Holmesburg Civic Association, Tacony Civic Association, Upper Holmesburg Civic Association, and East Torresdale Civic Association. The elected officials of the Municipality and the State, stand behind the Holmesburg Civic Association. Holmesburg/Upper Holmesburg were left to bear the burden of the now shuttered Holmesburg Prison, and five (5) operating Institutional Facilities along State Road, including Curran-Fromhold Correctional [CFCF] (7901), Alternative & Special Detention [ASD] (8101), Riverside Correctional (8151), Detention Center (8201), and Philadelphia Industrial Correctional [PICC] (8301). Great strides have been made along this Riverfront Corridor, and after four (4) years of work by the Zoning Code Commission (ZCC), a New Zoning Code was born, and this Use is prohibited. Upper Holmesburg has already begun a Comprehensive Community Plan with the City Planning Commission. Holmesburg, Tacony, and Mayfair will enter the same process. Please allow us to have a Community to plan for, and deny this crippling Use Variance. The Voices of the Communities should trump the Pockets of the Few. We were notified that the celebration dinner for Monsignor Charles McGroarty, longtime pastor of St. Matthew, scheduled for Sat. Jan. 26, 2012 has been cancelled. I know nothing about art. The only thing I do know is that I like certain art and I love certain artists. I adore Edward Hopper, Fairfield Porter, Andrew Wyeth, and Henri Rousseau. Why? No idea. I know little to nothing about their personal lives or their training. I just love looking at their work. Something catches me; a color, a subject, the composition, technique, and sometimes even a feeling. Clock covered in a sheet? Nope. Carved entirely from one piece of wood. AMAZING. 3. Unknown pair of paintings by an unknown artist on display at the Dale Chihuly art gallery in Seattle. They were $7000 for the pair and I could not walk away from them. I never found out who the artist was and I’ve regretted it ever since. If I ever see them again I WILL buy them. Those were the three times where if I had copious amounts of cash on hand I would have immediately plunked it down gladly and gleefully. I love art. 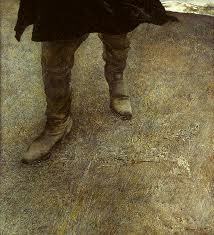 I love the ability of people to see a blank object or canvas and make it into something beautiful and interesting. I'm always in awe of people who work a certain medium (wood, glass, clay and paint) and create something inspiring. I myself am a dabbler. I paint occasionally when the mood strikes me and I've done a couple of stained glass pieces. 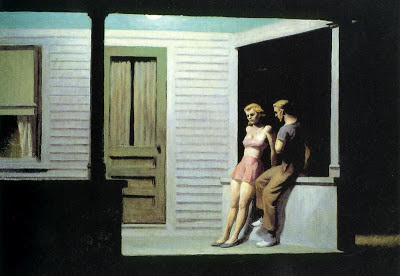 I'm pretty good at looking at something and copying it and there have only been a few times where I've actually created a painting wholly from inside of me and even fewer of those wind up actually being displayed. I'm my own worst critic. Art is subjective to most people. You either like something or you don't. 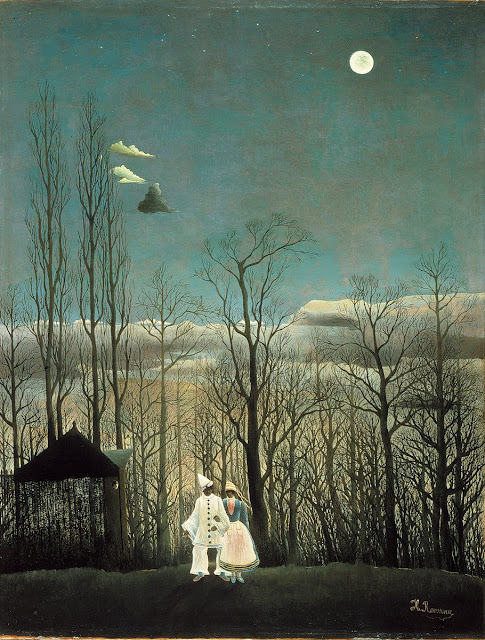 However, most artists are trying to express something to you; impart some form of creativity and feeling. For most of them, it's a passion. Few artists actually make a living doing what they truly enjoy as an outlet. So in all of the chaos of their lives and going about the business of being students, parents, spouses, children, etc. they take the time to create. Sometimes for an audience, but more often for themselves, because it's a part of them. Now many people like to say that Northeast Philly is a black hole of artistic expression. Granted, we aren't covered in wall-to-wall galleries like many of the hip neighborhoods but that doesn't mean we don't have our share of creative people living within our geographic boundaries I personally have met many people of all ages, sexes and walks of life who consider themselves artists or artisans. 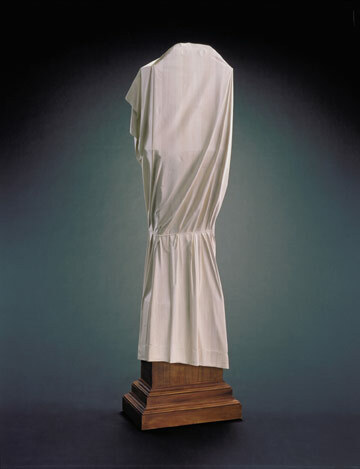 Lots of times it comes up in casual conversation; "Oh, I weave baskets, paint, do photography, sculpture, etc." Sometimes they may think they are the "only one" out there doing what they are doing. 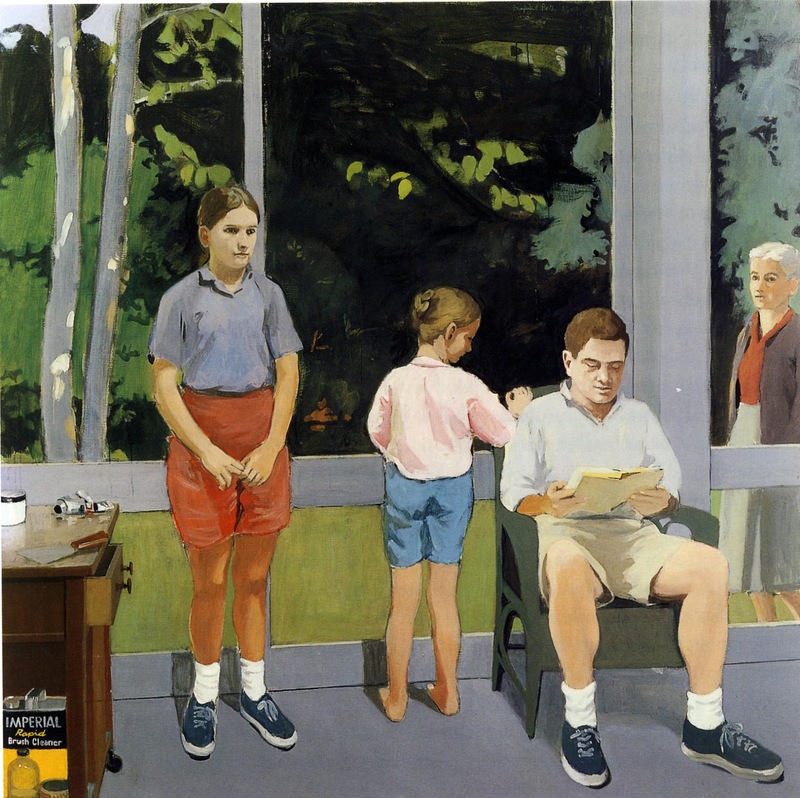 This Thursday, one of our MBA members and the chairman of the recently created Mayfair Art Initiative, Bill Becker, owner of Headquarters (7213 Frankford Ave.) will be hosting the first Third Thursday in Mayfair. It's going to be an informal gathering of local Northeast Philadelphia artists, photographers, painters,artisans and crafters displaying and discussing their medium, techniques, inspiration and hopefully showcasing some of their work. We know you're out there and we want to see what you do in your not-so-spare time. If you're willing to share, we want to see what you're working on or have worked on in the past. If you don't want to share at this point but at least want to take a look at what others are doing please make sure to come out for this unique event!! Even if your version of creative expression is repainting the walls in your house whenever the mood strikes you or making food sculptures out of your kid's peanut butter and jelly sandwiches...we WANT to meet you! Fifteen Dollars ($15). Available in all adult sizes including women's sizes. We will have them on Jan 23, 2012 at 7PM at the Mayfair Community Center at the January Mayfair Civic Association Meeting. Thereafter, they will also be available Tues-Sun at BellaLisa Hair Studio, 3530 Cottman Ave.
Mayfair Isn't as Bad as Mayfair Residents Say It Is! Mayfair isn't as bad as Mayfair residents say it is. Our neighborhood should reach back to that infamous Philadelphia billboard of the 1970's and adopt it as our own slogan. For the last three or so years, many neighborhood volunteers have spent time away from their families to make our community a better place to live. Usually when I pick up a copy of the NE Times or go on social media, the person badmouthing our neighborhood is usually one of our own residents and this is disheartening, to say the least. How do we expect other people to respect our neighborhood if our own people dishonor it? Let's be honest, Mayfair isn't what it was in 1980, its isn't what is was in 1990 and it, even, isn't what it was in 2000; but then again what neighborhood is? Some neighborhoods change for the good, some change for the bad and some just change, but that is ok. Different doesn't have to mean bad. Have we seen a decline in mom and pop shops on the Ave? Sure we have. Have we seen an increase in pajama pants in the afternoon? You bet. But that is ok because 2020 isn't going to be like 2010 and 2030 isn't going to be like 2020. I'm sure 2013 Fishtown and Bella Vista wouldn't recognize their 1990 ancestor, but that is what life, in the big city, is all about. Now, you can sit back and watch others enact change on your neighborhood or can get into fabric of the community and change it yourself, from within. - In 2009 there was a dirt and gravel patch on the east side of Lincoln High School which is now a state of the art, handicapped accessible $80,000 playground built with the sweat equity of the neighborhood residents. - We took a little used block of half vacant storefronts on the 3500 block of Ryan Ave and turned it into a one of a kind Farmers Market, that will be held biweekly starting this spring and will continue to include fresh vegetables, craft beer, local wine and neighborhood residents and merchants selling the wares, all the while, doing so with acoustic music floating in the background. - We took tragedies that struck our City in the form of Police and Fire deaths and turned them into positives with the Mayfair Fallen Heroes Run and have raised over $20,000 for the families of Police and Fire and an additional $10,000 for scholarships, plaques etc. - We took a parade that derailed off the Avenue due to a "budget crunch" in the City and infused it with citizen activists and neighborhood talent and put it back on the Avenue, bigger and better than ever. - We took neighborhood negatives like a proposed Methadone clinic and turned it into a positive by engaging over 800 residents, at community meetings, to stand up and fight to stop it and we won the first round. - We took a dilapidated, boarded up, vacant property that stood as an eyesore at Frankford and Sheffield and forced the owner to gut the place, fix the interior and install new windows and make it safe and habitable for a future family to call their first home. - Lastly, we've given the neighborhood events, that in the past, residents would gone elsewhere for, such as an Easter Egg Hunt, our Spring Mayfair May Fair, Fall Festival, Halloween Spooktacular and Christmas Village and heck, we've even made it a lot easier for the over 30 (maybe 40) crowd to tolerate the Shamrock Shuttle by working with the Mayfair Townwatch and the 15th District and, yes, the tavern owners to make sure that there was adequate police presence, portapotties and residents on hand to assist our out of town visitors that make Mayfair, whether we like it or not, a regional destination. So, with that, let me be the first to say, that I am proud of our neighborhood and you should be too. Let's start 2013 off on the positive foot and work to better our community so that the next time someone asks you if you still live in Mayfair (and hangs on the word "still"), you can say, "yes", proudly. We normally meet on the 3rd Monday of every odd month however, this coming month that day falls on the Martin Luther King Holiday and the Rec Center is closed so we pushed it back two days and will thus have it on Jan 23, 2013. PSA 3 Lt. Cook will provide crime statistics at the Town Watch Meeting and answer questions! !